This will be the last day of the Chinese New Year celebrations. 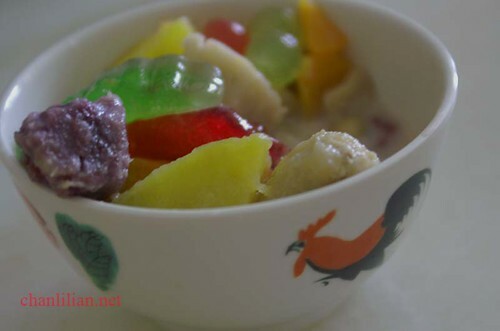 On this day, some of the Chinese, especially those from Penang and maybe Melaka will end the Chinese New Year with a sweet dessert call the Pengat. It is pengat and not bubur cha cha. Though they use almost the same ingredients, they taste way different. Pengat is much more flavourful, thicker and it has tapioca jelly. Usually, I like to cook my own pengat but since it is the weekend, I think I will crash out at my sister’s place for free supplies. Pengat is made from coconut milk as the soup. Then, black eye peas are used to boil for the flavour. In the olden days, the grannies took great task to make diamond shapes yam and sweet potatoes. They have to be of the same size and shape. Meanwhile, banana is cooked in syrup and added just before serving. 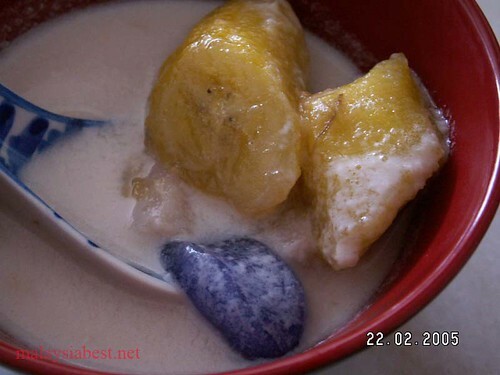 I have the recipe of pengat somewhere but just cannot find them now. So, if you are looking for the recipe, try the Google CSE search, ok? Hi there, this coming to you from Toronto, Canada. Came across your very interesting site as I was looking for “heong Piang”. I think thats what its called, that cake you eat and it breaks up into small pieces? You must be a gourmet cook looking at your mouth watering pics. Makes me lau nuar just looking at your pics. Last I was in Penang was in the 80’s. Always loved the Ferry crossing and New Year’s eve at E&O. You have a nice day, best regards and a Happy New Year to you from a stranger in Canada. Lee.